WCN Forums Picnic - July 22 Resources Supplies @ Wholesale Sponsors Safety News Events Mauer/GPD WCN Award Scratched Glass? 2 day course begins Thursday, July 20. Classroom & hands on Rope Access/RDS hybrid course for window cleaners at a nearby professional rope training facility. As per OSHA guidelines – this will meet your training requirement as an Authorized User. Train your team to become documented authorized users, based on all of the leading industry standards and regulations. Course completion meets your training requirement as an Authorized User, as per OSHA guidelines. Management of Safety Equipment in Industry. Define differences and needs for Qualified, Competent, and Authorized Persons. Equipment familiarization and inspection for Harnesses, Helmets, Descenders, Fall Arrest Rope Grabs, lanyards and Energy Absorbers, Carabiners, Ropes. Personal Fall Protection to include; Fall Restraint, Fall Arrest, Work Positioning, Rope Access. When to use each and how much each weakens the rope. Job Hazard Analysis & Work Plans. Mitigating Pinch Points and how to properly access your Seat Board. Standard Work Procedure and Motion. Pick off Rescue of an incapacitated worker. What you were trained on. How much time was spent on the training. As a sought after safety expert and trainer, Jeff Scott of Green Window Cleaning, LLC, has travelled the country to perform in-house training for window cleaning Companies. A 2nd generation window cleaner for over 20 years, Jeff knows the ins and outs of the window cleaning industry. Jeff Scott has earned the certifications and skills needed to tackle any high rise project safely. Jeff holds current Level II Rope Access Technician Certifications from both the Society of Professional Rope Access Technicians (SPRAT) in North America and internationally from the Industrial Rope Access Trade Association (IRATA). 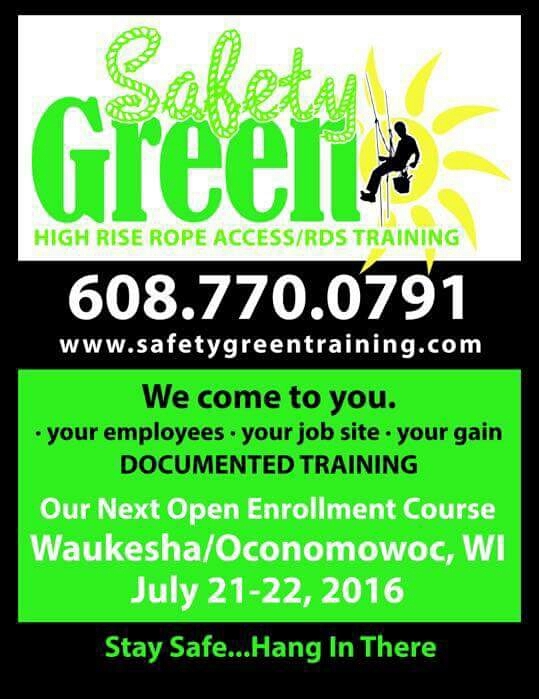 Pricing for open enrollment course in Oconomowoc is $500.00 per student. $100 discount for repeat students. Register for this course and the WCN Picnic - weekend of Saturday, July 22 - to get a $25 training discount, PLUS a $25 discount from the Picnic.